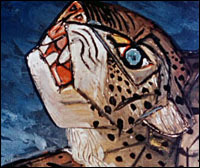 An unsettling and ultimately horrifying animation, A Short Vision (1956) presented a bleak future to the American audience that tuned in to watch the popular Ed Sullivan Show (which first screened the animation) in the late 1950s. The film's uncompromising vision of total nuclear annihilation was met with outrage and alarm, but, despite the horror it excited upon its release, A Short Vision has become one of the most influential British animations ever made. It captures the prevailing mood of nuclear paranoia during the Cold War and, as such, is a fascinating source to unpick in the History classroom. But A Short Vision has enormous potential elsewhere in the curriculum, in the Music, Art and English classrooms in particular. Don't forget to have a look at previous months' Show and Tell, which include two lyrical British Transport Films' productions, Terminus (1961) and Snow (1969), as well as Ridley Scott's first ever film Boy and Bicycle (1965) and the poignant short Jemima and Johnny (1966).